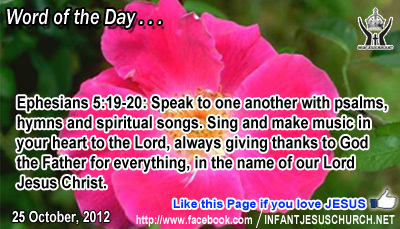 Ephesians 5:19-20: Speak to one another with psalms, hymns and spiritual songs. Sing and make music in your heart to the Lord, always giving thanks to God the Father for everything, in the name of our Lord Jesus Christ. Heavenly Father, you are awesome and incredible. Your works are superb and your deeds are beyond understanding. May the words of our mouth and the thoughts of our heart ever state your praises. May our heart be overflowing with thanksgiving for all that you have done to save us from sin, shame, law, and death. You alone are worthy of our praise, our songs, and our life. In the name of Infant Jesus we pray. Amen. None of us has the power and strength of will for conquer sin and evil on our own. We always stand in steady need of God's grace, help, strength, and defense. That is why scripture uses bright words to explain God as our refuge, rock, fortress, and mighty protection. We are also helpless to Satan's lies and deceptions as well as our own pious blind spots for recognizing sin and ethical weakness in our own lives. That is why we need God's help and judgment for unique between truth and error, right and wrong, good and evil. luckily the Lord Jesus, who is a just judge, is also a compassionate advocate who pleads for us at the right hand of the Father in heaven. The light of Jesus Christ expose what is in our hearts and his grace frees us from the oppression of sinful habits, upsetting desires, and harmful addictions. God's call is urgent and his grace is available for total liberty and transformation in Christ. If we want to turn away from sin the Lord is ready to give us the grace and help we need to choose for his way of love and sanctity. Are we ready for his saving grace and curative action in your life? Loving Infant Jesus, flood our heart with your love and free us for all that would keep us from doing your will. Transform our mind that we may discern what is right and have the courage to choose what is good and satisfying to you.